Hi everyone, I hope you all had a wonderful Independence Day weekend! I was so excited to have a long weekend. I spent Thursday at the park where my family has watched almost every fireworks show for my whole life. 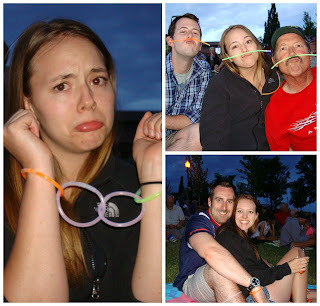 We obviously have way too much fun with glow sticks. That my sister being handcuffed; my sister's bf, her, and my dad; and then me and the bf below. Saturday I planned to do two of the crafts I've wanted to try for a while. The first craft was to glue a map onto canvases to put pins in for all the places I've been. BUT it just wasn't my day and that craft is now waiting for another map to be sent in the mail. So keep an eye out for that post and more on my crazy day. 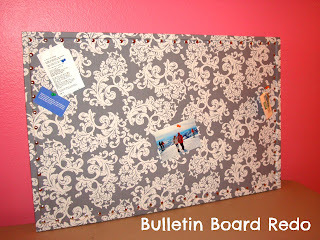 Second attempt at a craft went much better when I updated an old bulletin board by covering it with fabric. The original pin was found at The Newly Wife. 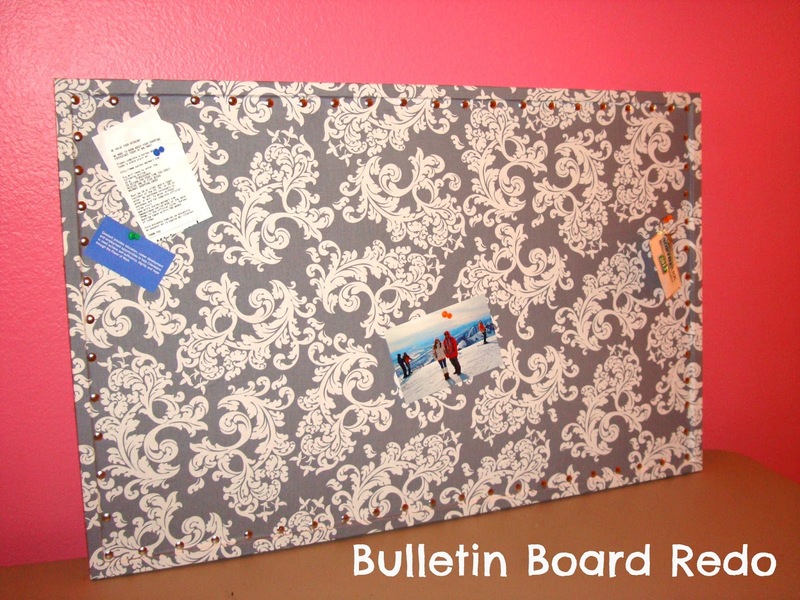 I found it easiest to lay the fabric down on top of the bulletin board in the way I wanted it, then flip it over and stapled one side of the fabric to the back of the wood border on one side. Then I flipped the board back over and started on the side where the fabric was stapled and in small sections sprayed the board with the spray glue and then pressed the fabric onto the board. Make sure to keep the fabric taught and start in the middle of the board and work out to smooth out all the wrinkles. After all the fabric was glued on I flipped it over and stapled the fabric to the wood border on the opposite of the already stapled fabric. Then I folded the edges over and stapled the two opposite sides. Since I glued and stapled the fabric, I figured it was safe to just use thumbtacks to border around the edge. And I liked the color of them the best.